The onions for an onion soup need long slow cooking in butter then in stock. Count on 2 1/2 hours from start to finish. 6 to 8 servings. In a 4 quart covered saucepan, sauté onions slowly 15 minutes in butter and oil. After cooking 15 minutes uncover, raise heat to moderate heat and stir in salt and sugar. 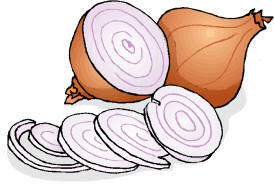 Cook 30 to 40 minutes, stir frequently until onions are deep golden brown. Sprinkle in flour and stir 3 minutes. Add bouillon and bring to a boil, remove from heat add vermouth, salt and pepper to taste. Simmer partially covered for 30 to 40 minutes. Set aside until ready to serve. (May be refrigerated at this time until ready to serve) Toast French bread slices in oven. When serving, put soup in bowl with 3/4 tablespoons cognac in each bowl, add toasted bread and cover with grated Swiss cheese or parmesan cheese. Melt in 350 degree oven.